This post is for Week 7 and 8 and our participants are still going strong! We are also definitely starting to see patterns. While the species assignments are randomly generated, I can look at the species and predict which ones I think people will find (or not find) with pretty good accuracy. Well known species such as Haddock, Cod, Lobster, Halibut, Scallops, and Squid are often very easy to find while some of our lesser known species such as Scup, Monkfish, Dogfish, Jonah Crab, and Periwinkles while abundant in our ecosystems and caught in our local fisheries, are not so easy to find. Our participants continue to search each week and most are very excited when they find a new species they are not familiar with. Many of them list the reason they choose one fish over another is because they want to try a new species and most are finding that they really enjoy each new fish as well as the more familiar favorites! "For week 7 I purchased Cod from the Local Catch. 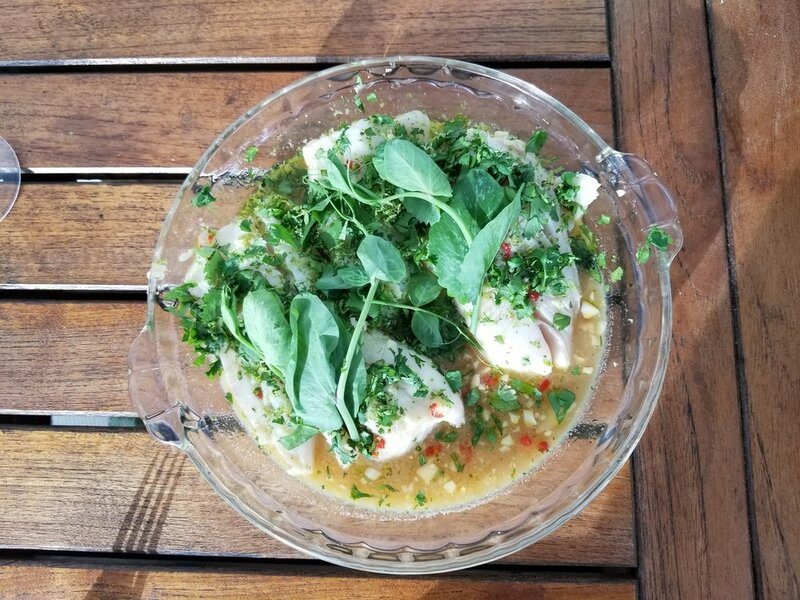 I steamed the Cod in the oven in a lime-chile-cilantro sauce. At serving I topped the fish with pea shoots. The result was a very tender and flakey fish. I was very happy with the result and will do more oven steaming in the future." "I've never had fish tacos, and the first time I heard about them, I thought that was a strange way to eat fish. So I thought I'd give it a try this week. My choices from the list that were available were Haddock and Halibut. The Halibut looked so nice and fresh, that I could not resist. I found a recipe with a southwest flavoring and went with soft corn tortillas. 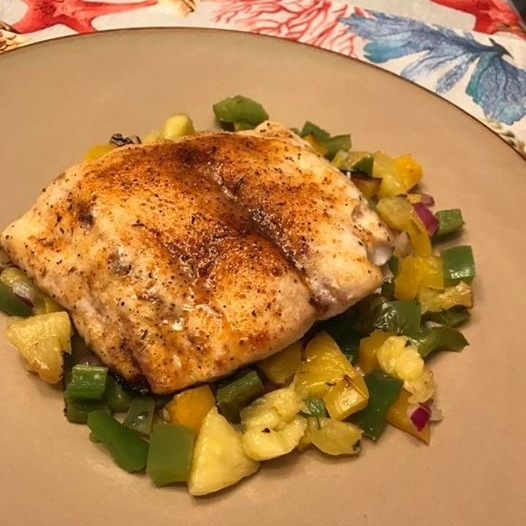 I used a cajun dry rub on the halibut stakes and pan seared them with a little coconut oil, about 4 minutes each sides. Warm tortillas were filled with thin slices of green cabbage and red onion, then chunks of cooked fish, a homemade southwest sauce, avocado slices, then garnished with diced red pepper, cilantro and served with a lime wedge. It was incredibly flavorful and light. Uno mas cerveza por favor! Southwest sauce: mayonnaise, lime juice, honey, vinegar, cayenne, paprika, garlic powder, cumin, salt, oregano." "Another week of research and learning for me... Jonah crabs was on my list but I learned that they are different from Rock Crabs but often found in the same locations. They are primarily caught as by-catch in the lobster fishing, are unregulated, available live, year round but I did not find any. Croaker is a by catch of shrimp trawlers found from Cape Cod to Texas, very productive in the Chesapeake Bay, I didn't find any. Swordfish, which I purchased and prepared, but have regularly - I was hoping for a new fish. It is available July - Dec, not experiencing overfishing, is about 5% above the established target and may contain higher levels of mercury (don't like that idea). John Dory - this is a fish I was hoping to find and try but wasn't able to. It is not pursued commercially, caught in small quantities as bycatch on squid boats, one of the best table fish available, available year round. The filets are naturally boneless, have a firm texture, buttery flavor and best prepared simply. I'm going to continue my hunt for this fish so I can try it - may have to resort to asking my friend who fishes commercially for squid... but he's out fishing!! A learning week with no chance to try a new fish! I will keep hunting!" "I have never cooked squid before and as a matter of fact - never even really handled it before. BUT now that I have, I will definitely cook it again!" "This week included trying to find butterfish but was told it would be another couple of weeks before the fish market would have some in stock. Another species for this week was haddock, which I found at a store a couple of weeks ago, but the stores contacted this week either did not have it in stock, or it was from Iceland. When asking about Mahogany clams, one fishmonger said that they are small and do not contain much meat. The only species found this week was Maine lobster. Lobster is very versatile and made ginger scallion lobster (http://thewoksoflife.com/2014/12/ginger-scallion-lobster-cantonese/) with the tail and legs. With the claw meat, made a lobster roll. And made lobster broth for a later meal with all the shells." "I told my son, who lives in Arizona, about this project when it began. I told him "When you visit this summer, you can help me search...and eat!" He arrived yesterday, and was very happy to learn that lobster was on the list for his homecoming meal...complete with the stuffies I had frozen from a previous week's list as an appetizer. No searching necessary, as the local chain grocer had them on sale, directly from the waters of Maine." "Eating squid was superfun and the kids really got a kick out of it. It was easier to cook than you might think and super yummy. A pound of squid goes a long way so it's inexpensive." Red Hake - wild and wonderful! "I think I really like the Hake as the appearance and texture after cooking reminded me of my favorite cod. It looked familiar to me! The flavor was a little milder than cod. Mussels were on my list again this week, which I had already chosen twice before and really didn't like the texture of them. I decided on Hake this week and glad I did. I prepared it in a very simple way, sautéd in a little olive oil, butter and lemon." "I had some Jonah crab fresh on salad with Chipotle lime goat cheese and a cilantro lime yogurt dressing- Fabulous!! Also made crab Rangoons for Chinese night... Delicious, but most of the filling fell out in the fryer due to my poor pinching technique. Should have learned from the crabs!!" "I ate steamers all the time growing up. In fact, I think they were the first seafood I ever tried. I have fond memories of my father buying 4-5 pounds of steamers and the two of us sitting at the kitchen table eating them together. My father and I don't have much in common and don't hang out much, but this was always an opportunity for the two of us to spend time together. I've been waiting for steamers to appear on my list and was super excited when I saw that this was the week! I drove by Anchor Seafood in Warwick on Thursday and saw that Maine steamers were on sale for $2.99/lb. This was great news and I looked forward to buying 4 or 5 pounds to share with my father. Alas, when I went to purchase them on Saturday, they had changed the price to $4.99/lb, so I only purchased two pounds and didn't have enough to share. I assume the price increase is due to the holiday weekend. Regardless they were very tasty and easy to prepare (I'd never cooked them at home before)." "Cunner is a difficult fish to find. And most seafood markets don't know what it is. So I was happy to see it at Champlin's in Point Judith. Unless you have an area outside where you can scale a fish, I would not recommend getting whole Cunner. Also, please invest in a good fillet knife. There are sites on the web that show you how to clean whole fish that are easy to follow. But it is time consuming. The fillets were small so I simply dredged them in seasoned flour and pan seared them in a brown butter sauce. They were very tasty . I would buy Cunner again because it is very inexpensive, good to eat, and I need practice in cleaning fish." Also congrats to Carolyn for being the first person to find cunner! "Lobster is always available anywhere within stones throw of the coast during the summer, so I chose to buy a lobster from a home-based business, on my way home from a spectacular day at the beach. At Clam Hunter, they sold cherrystones, steamers, oysters, and lobsters. I bought lobster and my partner bought steamers. After a sun-filled day, we went home and steamed them in a double steamer and dipped the clams and picked lobster meat in a butter with lemon juice, crushed garlic and cilantro. It doesn't really get any better than that..."
"For week eight, I was looking for halibut, squid, Acadian redfish, and herring. The stores I contacted this week had halibut, but from Canada. Neither store had Acadian redfish, also known as ocean perch, nor did it seem like they knew what fish that was. While the only herring offered was pickled. But both stores had local squid from Connecticut, which I was excited about because last week was cephalopod week on a weekly radio show, Science Friday. I had just listened (and watched: https://www.youtube.com/watch?v=jdpR6h-r9YQ) to how baby squid move through the water by jet propulsion. It’s cool to see their movement in water. The type of squid available was Loligo squid as known as long fin squid. Cleaning squid is a pretty easy and quick process, and the cooking process is fast. I decided to stuff the squid for my meal. The recipe I used was from the website epicurious (http://www.epicurious.com/recipes/food/views/stuffed-squid-109008). It was very delicious, easy, and an all around great meal." "I would tell people that I love how bluefish is a local species. It is one of my favorites to eat! I learned that getting the rest of the fish on my list was very difficult"
"For week 8 of #EatLikeAFish I had to search for Spiny Dogfish, Striped Bass, Butterfish and Acadian Redfish. I was hoping to find Spiny Dogfish on the cape, but I think I would have better luck going closer to Chatham. Striped Bass commercial fishing season opened today, so I was lucky enough to find it at local seafood markets! As On The Water Magazine likes to say, “you have 98 days between Memorial Day and Labor day to pack in your vacations, barbeques, and of course, your summer of striped bass fishing.” June is the “perfect month” because water temperatures are in the 55 to 65 degrees range, and bait is abundant. In July, its considered the “Monster Month” with big schools of stripers taking residence around Block Island and open water. With a rich flavor and large firm flakes, striped bass is a popular saltwater fish that is important both for commercial and recreational fishing. Tonight for dinner I made grilled striped bass, with a pineapple tequila salsa! Delicious! ? ?Stay tuned for next week’s #fishtale. #eatingwiththeecosystem #piertoplate #seatotable #eatlocal #newenglandseafood #eatseafood #eatfish #fishma #commercialfishing #knowyourfish #capecod #stripedbass #summer #stripers #localseafood #myfishingcapecod #docktodish #boattotable #fresh #local"
"My friend, Ryoko had shared her perfect method for cooking scallops with me. When I got them home I sprinkled with a bit of salt and let sit on a plate. Then I patted them dry and added to a pan with 50/50 olive oil and butter (this way they don't burn). I cooked on each side for 3.5 minutes and they had a perfect sear! Topped a caesar salad with homemade salad dressing and served with a stuffed scallop, which I also got a Daves. Have really enjoyed this whole experience! Summer is so busy but we're having a least one (sometimes more) fresh, home cooked meal at home each week. xo"
""Poor Woman's Lobster"** This week, both my partner and I (he is also doing this study), had one similar fish on our fish list- Monkfish, aka Goosefish. I have had Monkfish in the past and very much enjoyed it, so I was excited to look for it. Luckily, the fish market down the road had one, and a fresh one! The guy behind the counter brought out the fish before he filleted it- I knew they were ugly, but wow! We dressed this fish in a lemon, garlic, and butter sauce and baked it. It took a long time to bake because it was so thick. Once finished, the meat on the fish resembles that of a lobster tail. With the herbs and butter, the dish was quite tasty. I would definitely buy this fish again. The price was perfect and a pound was enough for two people. ** Lobster actually used to be considered poor person's food up until around the 20th Century." "Once again I was very disappointed that a large store like Shoprite (although each store is individually owned) didn't have any species locally landed. Whole Foods came through again! The squid looked great! Now to get it home and prepare it. My hope was that the squid would taste as good or close to as good as what I have eaten in different restaurants. I never imagined that it could be better! Prepared squid basically has no flavor but comes alive when served with a sauce of some sort. I now beg to differ after cooking it at home. The squid I made at home tasted fresher and had a nice mild flavor that could have been served with just a squeeze of lemon, although I had made two different sauces to serve with it. I will think twice before ordering squid out in a restaurant again after making it at home. Squid is easy to prepare and tastes better made at home!" "Who wants to cook when it's 90 degrees outside? I've been making any fish I can into ceviche. Before this study, I would've been a little concerned about making ceviche safely at home, but I've learned a lot about the fish I've eaten through internet research and recipe searches, and I'm more confident knowing the fish I'm buying now is local and very fresh." "I was looking forward to making skate but only found it frozen. Iv never had it when it has been frozen so I went for the yellowtail flounder on my list. The filets were very small so I made a rock crab stuffing and rolled the flounder. Rock crab was also on my list so it was a twofer. I baked it, super easy, super delicious! I will keep it on my list of must eat fish... Yum! I am stilling hoping for some fresh skate though? ?✌️"
"I found whole Black Sea bass at Seawell. I tweaked a bon appetit recipe and stuffed the fish with fresh mint, tarragon, basil, garlic, shallot, lemon, saffron and orange flower water. Delicious! Eating a whole fish does come with the challenge of the many bones but it was all part of the experience. Dined al fresco on a perfect evening, great way to celebrate the holiday!" "My griiling of the tuna went very well, 1.5 minutes on each side led to the raw center. Perfect! It looked great but really lack any flavor. With my eyes closed, I would never know that I was eating any seafood. The price shocked me! $29.00/lb is really over my budget for one tuna steak. But - live and learn. I am enjoying the hunt each week!!"